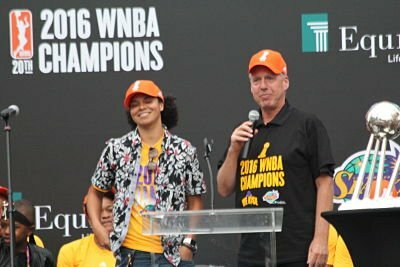 The Los Angeles Sparks celebrated their 2016 WNBA Championship Monday with hundreds of fans outside their home court Staples Center. 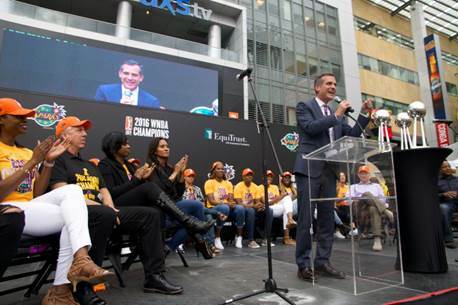 Mayor Eric Garcetti, Los Angeles County Supervisor Mark Ridley-Thomas and Ninth District Councilor Curren Price praised the team for winning the third title for the franchise, and the first in 14 years. 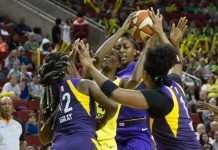 Sparks general manager Penny Toler and chief operating officer Christine Simmons expressed their excitement about the Championship and their appreciation for the athletes and fans. Members of the team took turns at the microphone, sometimes regaling the crowd with jokes. Coach Brian Agler declared Los Angeles to be “the basketball capitol of the world” that day. A little later he told guard Alana Beard she should come back for another year, hinting that she is considering retirement. 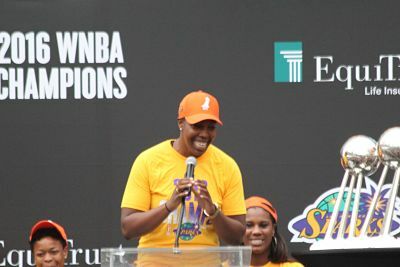 Evgeniia Belyakova, Sandrine Gruda, Ana Dabovic, Essence Carson and Chelsea Gray address the crowd. 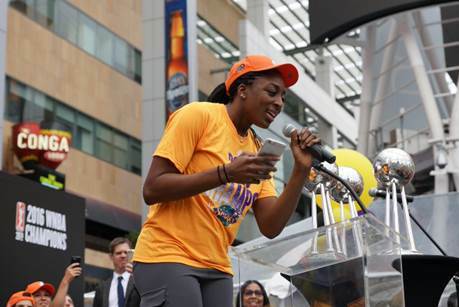 Nneka Ogwumike and Candace Parker take turns at the mic. Coach Brian Agler speaks to attendees. 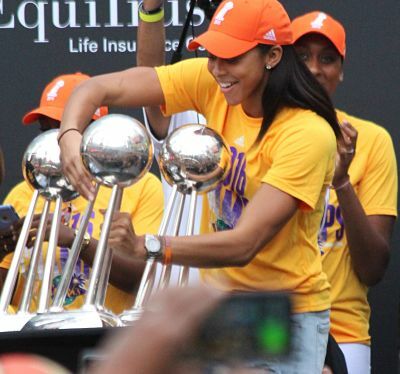 Candace Parker sets the 2016 Championship trophy next to the Sparks’ first two. Photo by Benita West/T.G.Sportstv1. 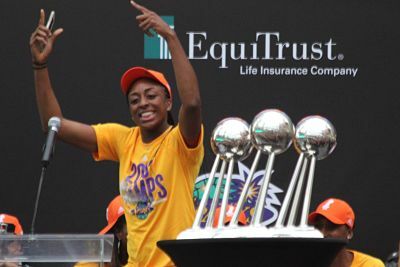 Nneka Ogwumike greets the crowd. Photo by Benita West/T.G.Sportstv1. 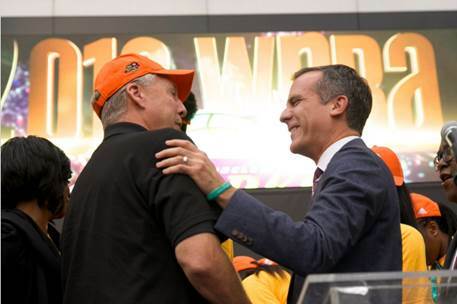 Los Angeles Mayor Eric Garcetti speaks to Sparks coach Brian Agler on stage at the team’s victory celebration. 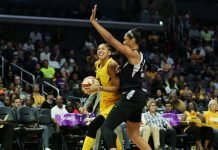 Photo courtesy of LA Sparks. Essence Carson talked about her journey to a Championship. Photo by Benita West/T.G.Sportstv1. Jantel Lavender came to the podium and danced before speaking. Photo by Benita West/T.G.Sportstv1. 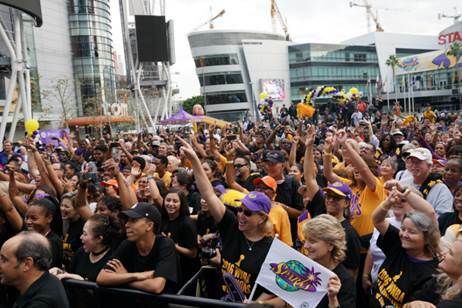 Fans packed the LA Live courtyard, across from the Sparks’ home court Staples Center, during the Championship victory celebration. 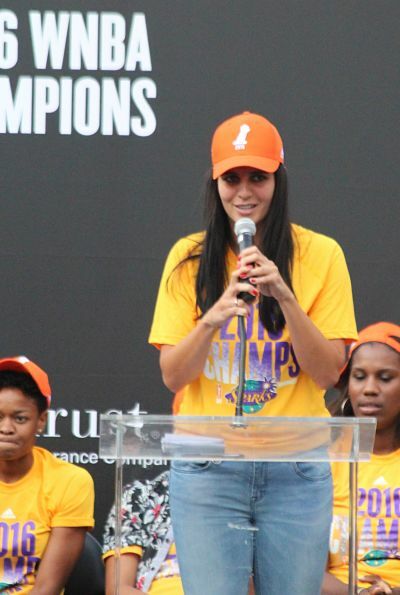 Photo courtesy of LA Sparks. Alana Beard takes her turn at the mic. Photo by Benita West/T.G.Sportstv1. Coach Brian Agler, with Kristi Toliver, had a few jokes to tell. Photo by Benita West/T.G.Sportstv1. 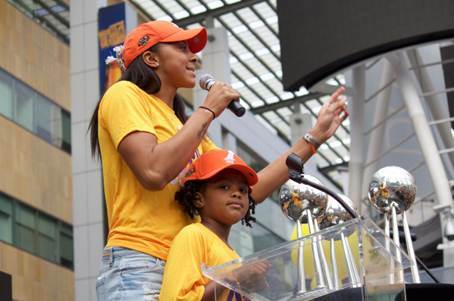 2016 Finals MVP Candace Parker, with daughter Lailaa, addresses the crowd at the Sparks’ victory celebration. 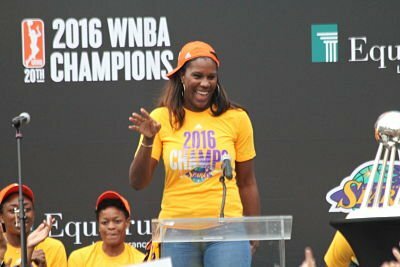 Photo courtesy of LA Sparks. 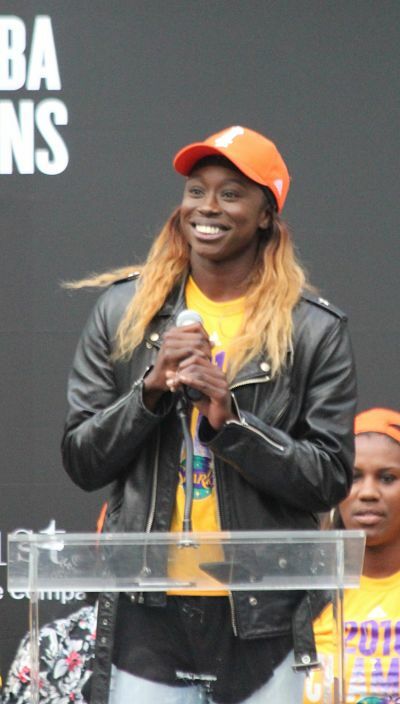 WNBA regular-season MVP Nneka Ogwumike takes a turn speaking to fans. Photo courtesy of LA Sparks. 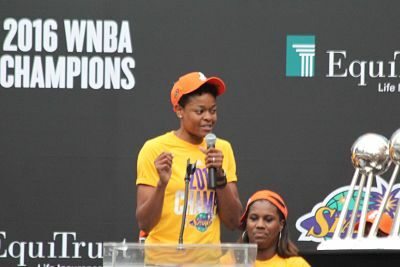 Chelsea Gray told attendees, “I love this team.” Photo by Benita West/T.G.Sportstv1. Ana Dabovic regaled the crowd with humor. Photo by Benita West/T.G.Sportstv1. Los Angeles Mayor Eric Garcetti addresses attendees at the Sparks’ victory celebration. 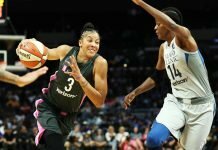 Photo courtesy of LA Sparks. 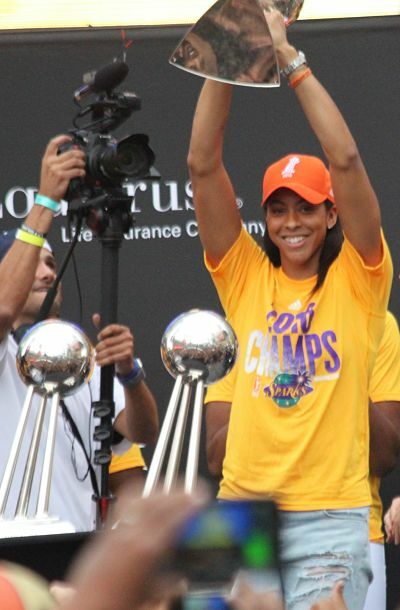 Finals MVP Candace Parker hoists the 2016 Championship trophy. Photo by Benita West/T.G.Sportstv1. MY SPARKS!! Thank you so much for sharing the footage. It’s always great to hear the stories behind the story and they definitely shared some great ones! lol! What a journey it has been for them….and for those of us who have supported them through every peak and valley. No one could have written a better ending to this season. So, so happy for them!